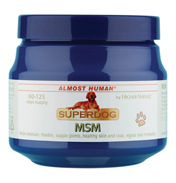 MSM is a natural substance found in food and in the human body that provides an organic source of sulphur. Sulphur is needed in virtually all tissues, especially those highest in protein, such as muscles, enzymes, red blood cells, skin and hair. As a supplement it may help maintain a healthy, youthful dog, with supple pain-free joints and an excellent skin and coat. One scoop typically provides 1.2g MSM.